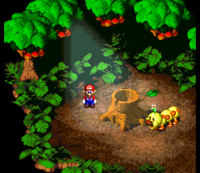 The Forest Maze is a labyrinth of trees and underground passages found in the game Super Mario RPG: Legend of the Seven Stars. It includes some underground caverns accessed by traveling down tree stumps as well as some regular forested areas, but the main part is a maze infested with unlimited enemies. Also scattered throughout the forest are Mushrooms that the player can collect. After Gaz's Geno doll is possessed by ♡♪! ?, he walks out of Rose Town and into the Forest Maze. Mario and Mallow, upon hearing this from Gaz, give chase to the doll. They eventually arrive at a a part of the forest that is taken over by Bowyer, a bow-like creature that is shooting Aeros at Rose Town. While Mario and Mallow spy on Bowyer, an Aero arrives and presents Bowyer with one of the Star Pieces. However, it is at this moment that Geno shows up, and attempts to fight Bowyer. With help from Mario and Mallow, Geno is able to defeat Bowyer and claim the second Star Piece. Afterward, Geno decides to join Mallow and Mario in claiming the remaining Star Pieces to repair Star Road. Later, in Seaside Town, there is a Toad called the Mushroom Boy that can taste a Mushroom collected here or bought to see if it is a rare Mushroom. In the children's book, Mario and the Incredible Rescue, Mario, Luigi and Toad go to Forest Maze in search for one of the six magic mushrooms. After finding the orange mushroom, the trio fights two Hammer Bros. 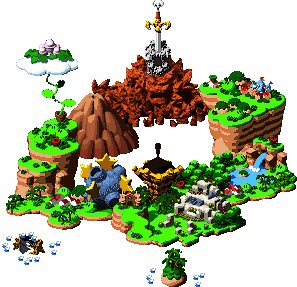 The music of the Forest Maze is famous among players of the game, and was chosen as track four in the arranged version of the Super Mario RPG soundtrack. Only five tracks were included. In the music, many birds may be heard chirping. On both soundtracks, the music was titled "Beware the Forest's Mushrooms!" A few notes of the track can be heard in the Toad Town and Peach's Castle themes in Mario & Luigi: Bowser's Inside Story. Being that Yoko Shimomura is responsible both for Super Mario RPG's music and the music in the Mario & Luigi series music, it is possible that this is intentional. This page was last edited on March 30, 2018, at 21:54.